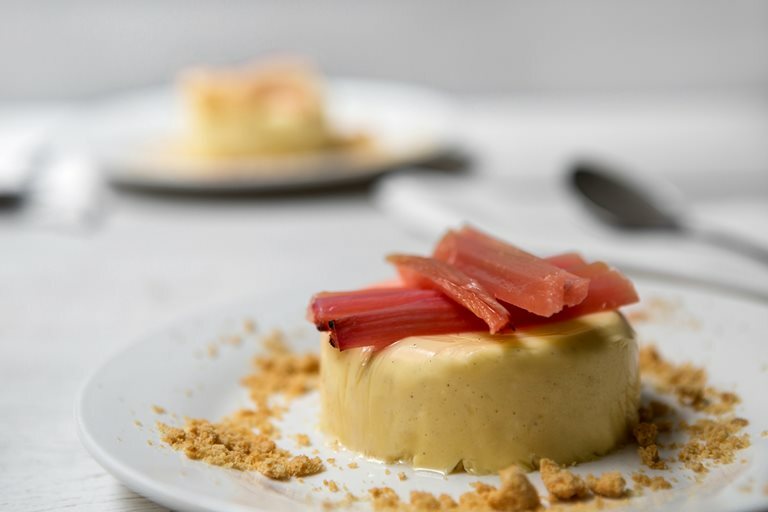 This rhubarb and custard panna cotta recipe makes the most of the season's most colourful crop, served with Victoria's recipe for ginger crumble topping for added texture. Grown in the dark, this vegetable masquerading as a fruit is the perfect pick me up on a winter’s day. With a little sprinkling of sugar, this tart veg is transformed into the perfect compote to pair with a splodge of natural yoghurt or to serve with oily fish or fatty meats. In fact, a side of rhubarb with pork belly is one of my favourite winter roasts. There really are no limits to this versatile, jewel bright crop. This pudding is a light and refreshing take on the classic British combination of rhubarb and custard. 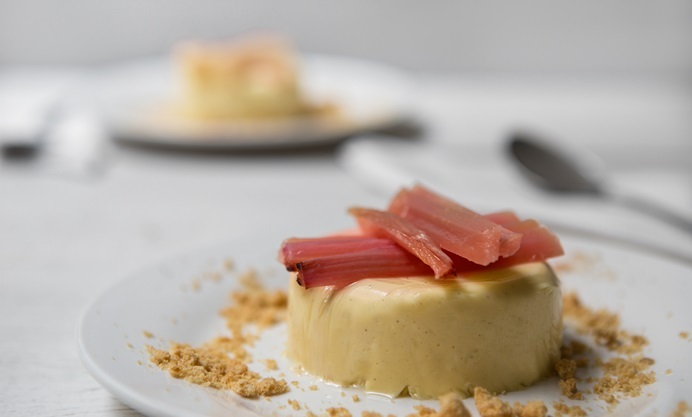 I've made a custard panna cotta - which essentially means that I've set it with gelatine instead of baking it - and served it with rhubarb which has been cooked with vanilla and sugar in the sous vide. You can just as easily bake it, but if there's any excuse to play with my sous vide machine, I'll take it. I made my custard with single cream, but you can use double cream if you're after something richer or whole milk for something less so. But please don't do anything as perverse as trying this with skimmed. If you're unfortunate enough to have skimmed milk in your fridge, my advice would be to simply pour it down the sink. It will be better for everyone that way. Alternatively you can bake the rhubarb with the water and sugar at 180°C for about half an hour or until soft, but not squidgy. Leave to cool.